Here’s another interesting way to create a single picture collage using the same image as the background. I’ve seen lots of this kind of collage on Flickr photosharing and often wondered how it was done. As I pondered, it strucked me recently that basically it’s just a cropped image laid on its bigger image to create continuity! So simple…just duplicate, crop and drag, blend and frame! In this tutorial, I’ll be using solely Adobe Photoshop CS2 to create a one-photo collage, using this picture as my example. 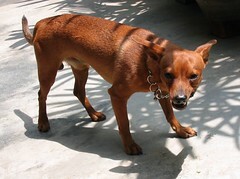 It is an image of our wonderful pet dog, Maxi, a cross-bred miniature pinscher! Let us begin. 1. Open the image that you want – Choose File > Open and browse to make your choice. Since it’s unwise to work on the opened original image, you’ll need to make 2 copies of it, one to be used as the background and the other to add onto the collage. With the original image activated, choose Image > Duplicate (a duplicate window pops up, type Collage or whatever name you wish) > OK. Repeat the last instruction to create your second copy (Collage copy). Now, close the original image. Arrange the two images on screen in such a way that all or some are visible. 2. With the Collage copy image active, tap C key to turn on the Crop Tool (or select it from the tool bar). Drag the Crop Tool over the part of the image you want to keep to create a marquee. The marquee doesn’t have to be precise as you can adjust it later by dragging any side handle. To complete the crop, press Enter (or double-click inside the cropping marquee or click the Commit button in the options bar). To cancel the cropping operation, press Esc (or click the Cancel button in the options bar). 4. Next, to beautify the added image using the layer style effects. In this example, I’ve given a simple border by applying the Stroke effect with 3px for size and a dark brown color extracted from the image with the Eyedropper Tool (or tap I), as well as enhanced it with an inner shadow (size 35px) effect. To do this – with Layer 1 still targeted in the Layers palette, select the Add a layer style button found at the bottom of palette and choose Stroke. (Alternatively, you can go to the top and choose Layers > Layer Style > Stroke). In the Layer Style window, make your desired choices in size and color. Play around with your selections and see their effects simultaneously on image itself when Preview is selected. Next, within the same opened window, choose Inner Shadow effect (click on the name to bring up its options) and make your choices. Click the OK button when done. 5. You will now want to enhance the collage with some aesthetic effects on the Background layer too. In the Layers Palette, double click on the Background layer and rename it Collage. This will unlock the background layer to allow layer styling options. 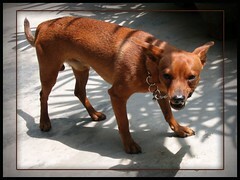 Here, I had wanted the edges darkened so that the dog’s image above it stood out. Thus, with the Collage layer still selected, click on the Add a layer style button and choose Inner Shadow and proceed with your selections. Here, I applied a shadow size of 250px. Click OK when done. 6. A frame will now complete the whole process. Select the Create a new layer button at the bottom of Layers Palette and notice a new layer named Layer 2 is produced. Click on this layer and drag to stack below the Collage layer. Now, you need to make this layer visible by increasing the canvas size. Go to Image > Canvas Size and in the window, enter the amount of increase in width and height size according to unit measurement that you desire, then click OK. You can now see the border added and if you’re not satisfied with the size, just press Ctrl+Z to undo and start again. In this example, I’ve added 20 x 20 pixels. Now you’d want to color the layer – Choose the color you desire and use the Paint Bucket Tool (or tap G). (Tip – if you want to use a color from the collage, use the Eyedropper Tool to extract the color). 7. Finally, you can now save the finished collage in either jpeg or psd format or both. To save, choose File > Save as, and then proceed as guided. I would normally save in both formats, making sure that the photoshop format is saved as layers, just in case I’d want to make any more changes! Remember to delete the back-up file saved temporarily at Step 3. FINISH!! That’s about all! Here is the completed image! This tutorial is very basic and simple. Hope it has been helpful! Nice job. Very well done. Thank you for telling me about it.